Dana Dolly Precision Track kit. Kit will ship on or about May 6th, 2013. Kit includes: 6- 36" Sections of Track, 4-Track End Adapters, Splicers, Custom SKB Case, Tool. 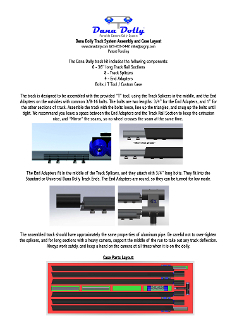 Works with all Dana Dolly track ends and kits. Made in USA. Dana Dolly, Track Ends, Stands, Fluid Head not included.